It's been a long gap. I've been doing other things with my time. I've been thinking I should know more. I'll never know enough. Why suddenly let ignorance get in the way? S0, this morning I went for a walk up the slope - past my old friend the blackthorn - see the silhouettes of sloes? 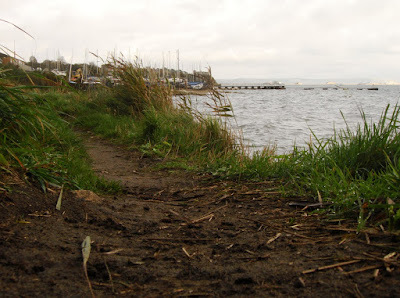 Then I went down a little path to the sea. Here comes the ignorance bit for, beside the path was a plant with leaves that look like scented geranium and yellow, daisy-like flowers. I don't know its Latin Name. I don't even know its common name. But why should that hold me back? (Linda at Garden Girl has left a comment in which she suggests this yellow flowering plant is Golden Marguerite (Anthemis Tinctoria). She says, too, that she once had some in her garden. It strikes me, quite frequently, that there's a kind of living archaeology to be found in the hedgerows - hints of what used to be there. There'll be a post on that sometime! That was on the ground, on the left. This was the view to my right. Mostly Blackberries but not bad, eh? And at the bottom of the path . . .
Reeds . . . and the sea! Looking right . . .
And where the cliff touches the beach . . . a little plant of green leaves. And back by the reeds . . . these . . .
And here are the boats - boats in blue coats for the winter. Then up the bank . . .
And over the top to the teasles. Who looked at the plants? Who looked at the sky? I can't keep my eyes off the sea! Thank you for taking on your walk with you. What a beautiful area by the sea. I'm sorry that I can't help with any plant id's. It was a combination of reading your blog and a nudge from Diana at Elephant's Eye (http://elephantseyegarden.blogspot.com/) which made me rush out, earlier today, with my camera. I don't think I expressed that very well. I'm being defensive! I specilly like that header photo too - and hoped, when I put it there - that you wouldn't miss the shoe! The grass is interesting, but I can't keep my eyes off the sea, either! I feel like I was out there walking with you! What a wonderful area! Land, sky and sea all look grand to me. Excellent post. How lucky you are to live near the sea Lucy! The ocean is a favorite destination for me. The closest large-ish body of water we have is Lake Michigan, but even that's way too far for walking to it. It's less than an hour away by car or train. Your photos are wonderful. I love the header. The yellow flower looks like it might be Anthemis tinctoria - golden marguerite. The blooms and foliage look very much like it to me. I used to grow it in a previous garden. Hello Grace, Koala and Robert. Pleased you enjoyed the walk down to the sea and back. This wasn't originally going to be a Skywatch post but the sky got stormier and stormier as I went along and in the end, I couldn't resist making the link! Hello James. I'm glad you've found LOOSE AND LEAFY. Your blog is one of those I admire. 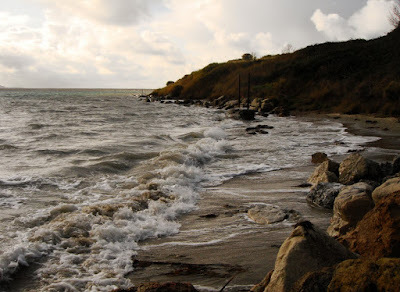 I would find it hard not to live in easy reach of the sea - or at least a fast flowing river. Mind, ever since I saw photos from the Spring Fling - Chicago has gone very high on my list of places I would like to visit. Thanks for naming the yellow flowering plant. I'll adjust the text accordingly. I keep meaning to do a post about the 'garden' plants one can find growing wild round here. This is another incentive to get on with it! I looked at them all! I was thinking of SkyWatch as I was enjoying your photos. I normally do that, but was late last week, and haven't done it this week yet. I forgot to do Blooming Friday, too. I've only seen an ocean once. I live in Nebraska, in the U.S. I was in awe of it, and hope to see one again. In the mean time, I enjoy the photos I see on blogs. 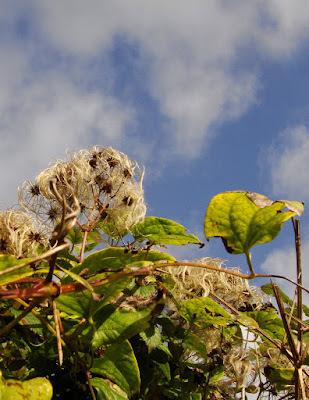 Love that wild Clematis, with the blue sky behind it. Fantastic! Lovely photos of pretty scenery. 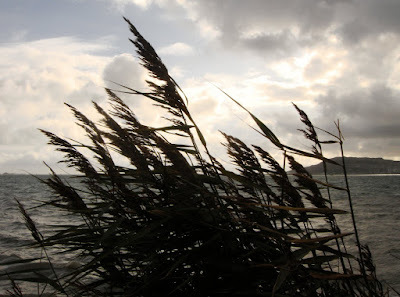 My favorite is of the reeds and the sea. Thanks for sharing your skywatch. I am in green and wild mid Wales right now - you have inspired me to take a walk with my camera! Thanks! Great pictures, and I love the idea of boats blue coats, for the winter...lovely. 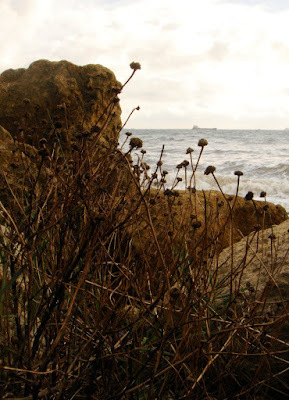 Love the shoreline photos, truly I do! I agree with Linda about the Anthemis tinctoria; I love this plant; it blooms both in spring and in fall (until mid-late Nov. I'd guess). I got seeds of it a few years back of a plant at the Gatehouse at Fernwood Botanical Gardens where I was giving a talk. The funny thing is, the common name I know for it is yellow chamomile, and I like golden marguerite much better! 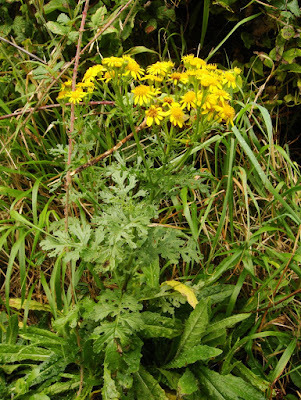 It looks more like Ragwort to me Lucy - a common wildflower which is poisonous to some animals such as horses. It's from the Senecio family, not Anthemis (Marguerite), though they do look similar. I've been trying to imagine what it would be like to see the sea for the first time. I would imagine it could be quite overwhelming. For my part, I would be frightened if I couldn't live within easy reach of it. If I were to live in a land-locked place I'd feel trapped - even though I hardly ever go anywhere on the water! When I see Old Man's Beard like this, I appreciate it. When it all piles up in a huge grey blob and what it is climbing over disappears under it - I am less enthusiastic. I like the reeds a lot too. I suppose I should feel overwhelmed by them because they stand in vast numbers and are often higher than my head but I like to walk in the little tracks between them as well as see them picked out against the sky. Thanks Miriam Elizabeth. I am privileged to live in a very beautiful area. I'm continuing to envy your travels. Wales, even in the mists and the rain is a wonderfully inspiring place to be. Glad you like the shoreline photos. I find I like looking at them too - even though I can look at the 'real thing' almost as easily. Do the leaves of the Golden Margueritte smell like Chamomile? I know there are many who like chamomile tea but, to me, trying to drink that is like trying to drink warmed up drainage from a compost heap. I've a horrible feeling you are right. We have masses of it round here - but all the rest finished flowering ages ago and it was much much taller than this particular plant - which is also comparatively compact. Somerset Trading Standards has a photo of Senecio Jacobaea (Common Ragwort) which is a twin sister to the photo I have here. Going only by internet pictures . . . the Anthemis Tinctora leaves are different . . . the Marguerite I'm familiar with also has more feathery leaves than these (which is probably not the right description because I don't mean 'feathery' like fennel but I daren't go more Botanical for fear of confusing things more). The trouble is, if I put it in the Ragwort family . . . the leaves of Senecio Jacobaea in my ID book don't look like the ones on 'my' plant, even if they do look like the ones of Senecio Jacobaea in the photo provided for the benefit of Somerset farmers. My hair is coming out . . . I suppose I'll have to go back and see if it has black bracts . . . I realise now I shouldn't have raised the issue at all . 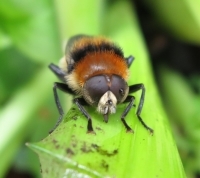 . . there was a brief discussion about Ragwort on this blog last year and I remember from then that Ragwort throws up all sorts of questions . . . like which versions are poisonous to horses and which aren't . . . I'll go and amend the text of the blog again.
. . . the mystery of the very ordinary but also very beautiful yellow flowers . 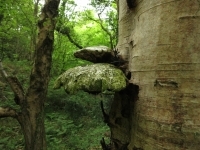 . .
Have just been talking to someone from Natural England. He says Common Ragwort is the only ragwort mentioned in the Weeds Act because the Act was passed in 1959 and is out of date rather than because Senecio jacobaea is more dangerous to grazing animals than the others. Any ragwort on grazing land will be pulled out. But he also points out that it has its benefits too. For instance, the Cinnebar Moth likes it. 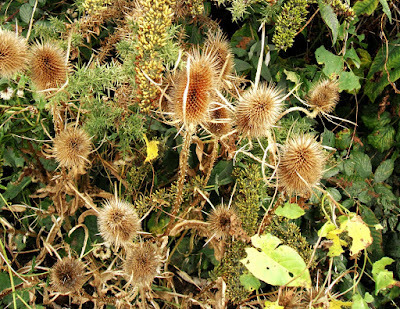 If there were a new Act, he would like to see it widened so it could include certain invasive plants (at the moment it is only five 'injurious' plants) - so people would be required to pull out Japanese Knotweed. I'm so glad you have enjoyed this post, Mary. You too have some very lovely photos on your blog. Hello Dee - living near the sea can be both exhilerating and frightening. As for gardening - there are doubtless places where the salt (and the winds) makes it difficult but there are also some wonderful gardens. For instance, there are fabulous sub-tropical gardens open to the public at Abbotsbury which is about nine miles from where these photos were taken. Thanks for popping over to mine. Have enjoyed reading about your walk. The clump of leaves in the picture with the grass looks like sea beet to me. Maybe.